A whale found dead off the south coast starved to death, initial findings have revealed. 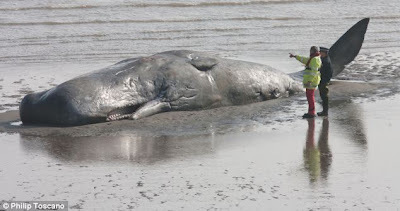 The 45ft long sperm whale was found stranded on a beach in Pegwell Bay, off the Kent coast, yesterday. The juvenile male had not eaten for some time and had become dehydrated, a preliminary post-mortem examination found. Scientists from the Zoological Society of London carried out the investigation as part of the Defra funded collaborative UK Cetacean Strandings Investigation Programme (CSIP). Rob Deaville, project manager of the CSIP, said: 'Preliminary results from the post-mortem examination indicate that the whale had not fed for a long time, suggesting it had become dehydrated, which most likely played a role in its live stranding. 'Further tests will now be carried out to determine the full picture'. The mammal was spotted at yesterday morning and although rescuers were called it later died. Whale beachings are rarely explained. Scientists attribute them to natural and environmental factors such as rough weather, weakness due to old age, hunting too close to shore and navigation errors.